Your baby can lie or be held and is given ample space to roll over and move towards interesting objects that support sensory and motor explorations. 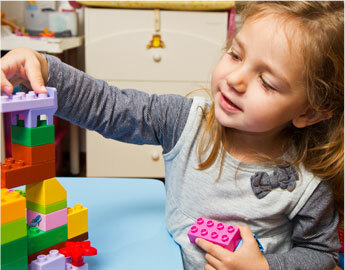 Toys are responsive to the child’s actions and scaled to a size that enables him or her to grab, chew, and manipulate (e.g., clutch balls, music instruments, push and pull toys, rattles, soft washable animals, dolls, and teethers). Ramps, steps, and low climbing structures will help build motor skills and coordination. Your child’s own crib (or cot) and quiet sleeping area are incorporated into the room’s design. Your baby will be able to form a relationship with a primary caregiver who is responsible for building your baby’s trust and emo- tional security. All of his or her unique needs will be met predictably and consistently and daily communication with the parents is established and maintained. Alex has been going to Happy Days since he was 12 weeks old. All of his teachers were so wonderful, and from each one he learned a different lesson. 12 children per class with a ratio of one teacher per six children. 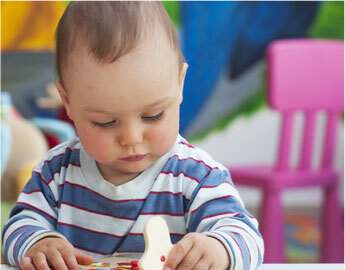 Activities are designed to offer the twos chances to be in control, participate in group play, music and movement, art, and fantasy play (e.g., doll area, blocks, science, make believe, music, sensory area, art center, quiet book area, and a wide variety of manipulative toys). At Happy Days, there were always stimulating activities going on for the kids. Frequently, I would receive unsolicited comments about what my girls did during the day, and I always felt that the caregivers were all genuinely interested in their progress and achievements. The environment of this room was designed to fulfill and aid the physical, emotional, intellectual, creative, and social needs of the children in this age group. It promotes a positive climate for learning, where children are challenged to participate in learning experiences that reflect their ability and developmental level. Teachers help lay a foundation for group play (art projects and dramatic play) to build a sense of cohesive community, learn constructive relationships and sustain beginning friendships. The daily schedule is designed to allow alternating periods of active and quiet time. The ambience at Happy Days is so welcoming to the infants and toddlers that they never feel there away from us. Rehan was always eager to go to preschool because of the staff’s incredible warmth, love, and care. Includes pretend play at the doll area and dramatic play area (play house), reading books, putting on a puppet show, discovering physics at the block area, a hands on experiment at the science area, playing a musical instrument, solving puzzles and playing educational games on the computer. Happy Days’ staff deserves very special recognition. Their school has a team of teachers who is experienced, warm, loving, and attentive. 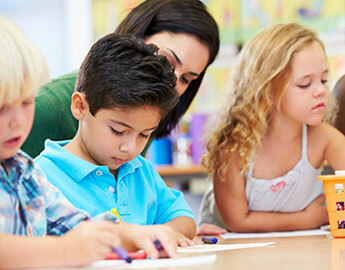 Your child will soon be entering elementary school and will experience new expectations and learning styles. To help in the smooth transition, we have designed our K class environment as a bridge between the preschool and school years. The goal is to help children develop concepts and skills in language, literature, reading, mathematics, writing, social, music, science, health, aesthetics, art, social studies, and gross/fine motor skills.There is a balance between hands on learning centers (pre-school style) that promote individual and group exploration and our highly academic phonics and math programs (school style) which were designed to help children read and write as well as achieve kindergarten level math reading. 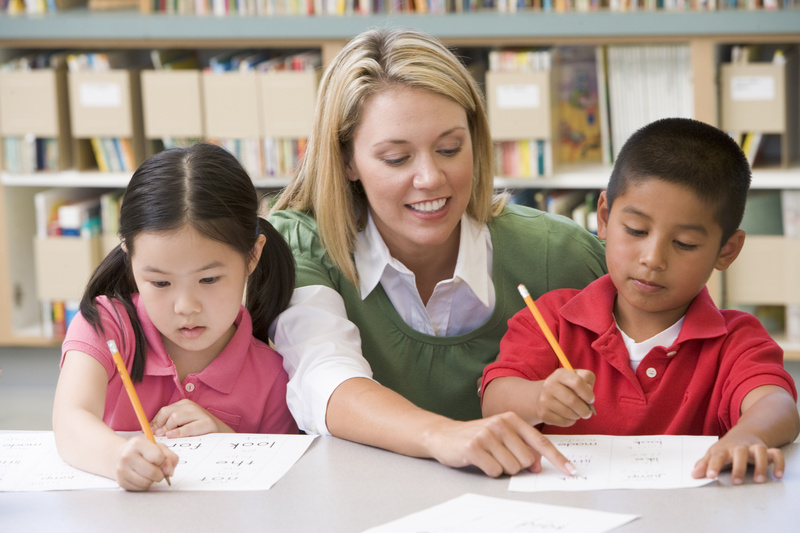 Our phonics program will develop five major skills: oral language, auditory discrimination, visual discrimination, kinesthetic development, and linguistic skills (reading). In learning centers (pre-school style), there is a big variety of meaningful activities: children seek solutions to concrete problems, measure sand, water, and cooking ingredients, observe and record changes in the environment, construct with blocks, classify objects for a purpose, explore plants and animals, express feelings and what they see through art, music and dramatic play. Michael has acquired a lot of knowledge at Happy Days. He was most excited to show off his math skills, and he asked us many questions about Nature, History and Science.